Explorer 5 in 1 trike by smarTrike® moves with ease thanks to our patented Touch Steering® technology and adapts to your child's growth throughout 5 stages of development. Equipped with a premium reclining seat and a UV protective canopy, your precious cargo will have a comfortable ride while on the go. Available in a variety of trendy colors, the Splash comes with a high quality removable storage bag and convenient bottle holder to help keep you and your little one organized. Stage 1 Reclining Seat: From 10 months sleep mode allows your precious cargo to rest in comfort and security with our high backed reclining seat and safety bar. Stage 2 Stroller Mode: At 10 months and up, your child can safely use the foot rests and sit up comfortably in the padded seat. Stage 3 Guided Trike: At 18 months when your child can sit upright on their own, simply remove the safety bar, allowing your child the feel of independence. Stage 4 Training Trike: At 24 months turn the Splash into a training trike, allowing your child to learn how to pedal by themselves. Stage 5 Classic Trike: At 30 months, remove the parent handle, turning the Splash into an independent trike which your child pedals and steers without your guidance. 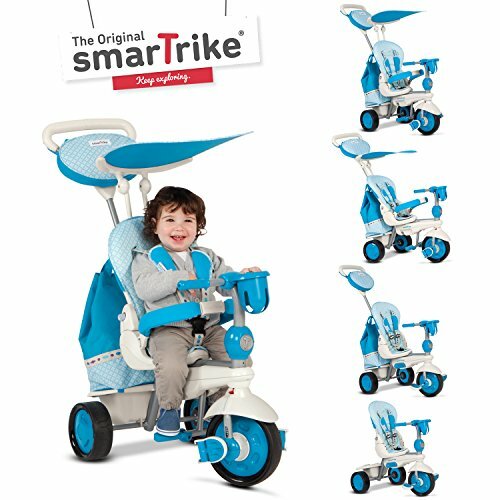 If you have any questions about this product by smarTrike, contact us by completing and submitting the form below. If you are looking for a specif part number, please include it with your message.